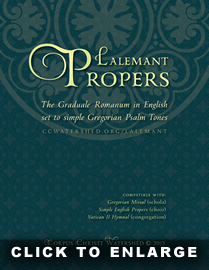 Introducing the Lalemant Propers (391 Pages) — Free Download ! OCUMENTS FROM the Second Vatican Council encourage Catholics to “sing the Mass” rather than replacing the Mass with non-liturgical texts. This practice is an outgrowth of a maxim attributed to Pope St. Pius X: “Don’t pray at Mass, pray the Mass.” However, those attempting to introduce the Mass Propers at their parishes realize absolute consistency is necessary. Therefore, what happens when a cantor gets sick or there is not adequate time for the choir to learn a chant from the Graduale Romanum or Simple English Propers? Or what about circumstances where a choir is not present, such as a 7:00am Sunday Mass, or (perhaps) a special Holy Day? What about the summer months, when some choirs do not meet? If the Propers are simply omitted, this causes considerable confusion for the congregation, which was previously told that each Mass has special Propers which ought to be sung. We know very well that the Liturgy is complex and must not constantly switch back and forth with changing texts, practices, and musical choices. Constant changes are quite disruptive to Liturgical prayer. Visiting this website, one can freely download the entire 391-page book. One can also purchase a beautifully-bound hard copy. Below is a video example of a setting from the Lalemant Propers. This random selection is from Holy Saturday, so one can see this new collection contains much more than just antiphons (for instance, the Good Friday Reproaches, forty-five complete Psalms, Sequences, etc.). HE COLLECTION is named in honor of St. Gabriel Lalemant, one of the bravest men ever to set foot in the New World. 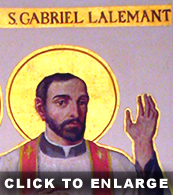 St. Lalemant worked alongside St. Isaac Jogues and the other Jesuit Martyrs of North America. Most of the Corpus Christi Watershed projects are dedicated to these Martyrs, as well as their colleagues who have not yet been canonized. For instance, if you visit the St. Charles Garnier Website, you will notice many Gospel Acclamations named in honor of French Jesuits. By pressing the «View Previous 2 Months» button, you will see names like Fr. François Bressani, William Couture, Fr. Simon Le Moyne, Fr. Paul Ragueneau, Fr. Pierre Chaumonot, Fr. Joseph Le Caron, Fr. Claude Dablon, Fr. Pierre Chastellain, Fr. Jérôme Lalemant, and Fr. Barthélemy Vimont. I feel strongly called by God to help make the Jesuit Martyrs of North America better known. The first musical CD I ever produced (2001) was dedicated to them, and through the years we have done what we can. However, there is still so much more that needs to be accomplished to make their stories better known. Of course, it is not always possible to do as much as one would like, as the primary object of our organization must be to survive and continue providing resources for the Liturgy. However, I will continue to pray that the Lord will grant this request: that through the years, Corpus Christi Watershed can be a vehicle to let every person in North America know and honor the holy Jesuit Martyrs.